The durable indoor and outdoor small foldable table by Everyday Home is the perfect multifunctional table. Foldable table has a powder coated frame with a top that is made of high density polyethylene plastic. This table adjusts to 3 different heights: 21 inches, 24 inches and 27 inches. Our table is ideal to use for crafting or sewing projects, a TV tray, patio table or any place an extra table is needed. MULTIFUNCTIONAL TABLE - Table adjusts to 3 different heights: 19 inches, 24 inches, and 28 inches. This table is ideal to use for crafting or sewing projects, a TV table, patio table, laptop table or any place an extra table is needed. TAKE IT ANYWHERE - This lightweight durable small table is designed for both indoor and outdoor use. Also, folds flat for easy transport and storage. 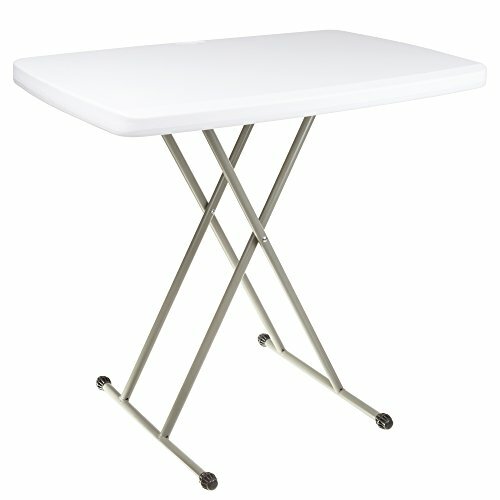 EASY TO CLEAN - Foldable table and TV Tray is stain resistant and cleans within seconds. Also, used for a kids table or an additional dining table. If you have any questions about this product by Everyday Home, contact us by completing and submitting the form below. If you are looking for a specif part number, please include it with your message.